Chemical-based cleaning products can be expensive and are not so great for our health, but sometimes we need a bit more than water and elbow grease to clean stubborn mess in our homes. Lucky there is a natural alternative to almost everything and that includes all purpose cleaning spray. 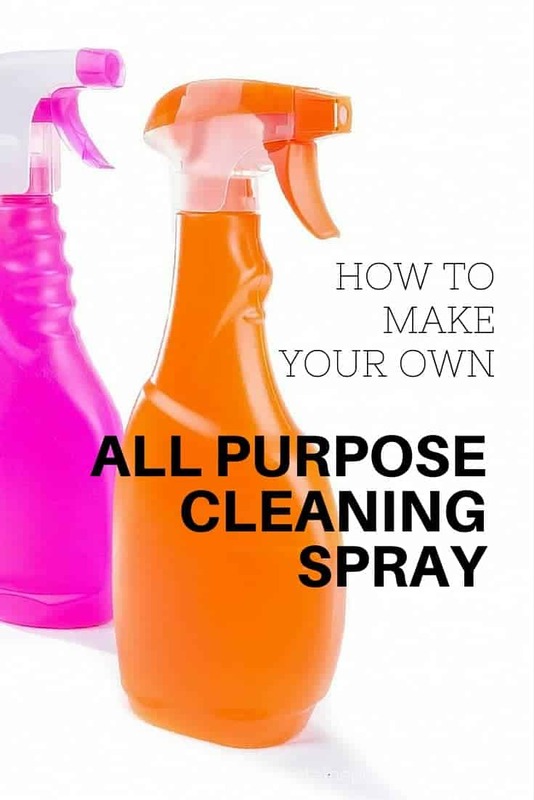 Make your own all purpose cleaning spray at home, using natural ingredients you may already have in your home. Making your own natural cleaning products is not only an effective non-chemical substitute, but also a fraction of the cost of most store bought cleaning products. Combine all ingredients in an empty spray bottle. Shake well. Use all purpose cleaning spray in the place of your existing chemical-based cleaning sprays, i.e. on benches, tables, stove tops, other kitchen surfaces, bathroom surfaces, highchairs, and any other surface suitable surface. Tea tree oil, lavender oil and eucalyptus oil are all great options due to their antibacterial and antifungal properties. They will also leave a fresh scent as you clean. If you prefer natural cleaning products, be sure to check out my other natural cleaning recipes and methods, so you can simplify your life and minimise nasty chemicals from home. What is the one cleaning product you can’t live without? I love using baking soda and white vinegar to clean the dishwasher… Did I really say that I love it. I mean I use this. That is some serious passion for cleaning right there! LOL Natural does make it much nicer though ? I would do anything to keep the dust at bay! Pets and dander and my own hair are my worst enemies! Thanks for linking up to Merry Monday! Hair is one of the worst. Mine always falls out much worse the few months after having a baby… Which is now. Ick! The smell is better too 🙂 we have been working at complete home conversion with natural products lately… Even more so since discovering Norwex. My niece is a consultant and the products are fab. Almost all just water but I still like to have a spray for surfaces. Lavender is great for relaxation too which is an added bonus!